Unionized workers at Ford Motor Co. have approved contract changes that include freezing wages and cutting benefits in a move to aimed at helping the automaker remain competitive. 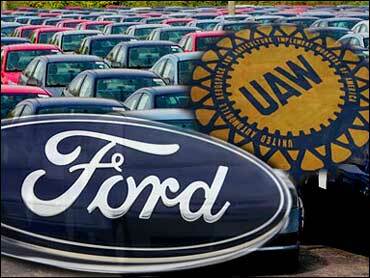 The UAW said 59 percent of production workers and 58 percent of skilled-trades workers voted for the concessions. "By working together with our UAW partners, we identified solutions that will help Ford reach competitive parity with foreign-owned auto manufacturers and that are important to our efforts to operate through the current economic environment without accessing a bridge loan from the U.S. government," said UAW President Ron Gettelfinger in a written statement. The ratified deal also ends the controversial jobs bank program that let workers collect most of their pay from the company. The concessions also let Ford make payments in stock to a union-run trust for retiree health care. Ford, which has not sought government funding as rivals General Motors Corp. and Chrysler LLC have, is the first U.S. automaker to come to an agreement with the union. The details of the Ford agreement are expected to be a guideline for GM and Chrysler. The UAW must now negotiate concessions on the health care trust with those two companies as a deal with the union is a requirement of the $17.4 billion they have received in federal aid so far. Members of President Obama's auto task force toured Chrysler and GM facilities in Michigan on Monday. The two companies have received more than $17 billion in government loans and the task force will decide if they should get more. But, reports CBS News business correspondent Anthony Mason, some top Republicans - including Sen. John McCain - say "enough," let GM file for Chapter 11. It's a drastic step, but as Mason reports, some experts believe it's the best choice for the ailing automaker. Shares of Ford rose 4 cents to a $1.74 in late afternoon trading. "By working together with our UAW partners, we identified solutions that will help Ford reach competitive parity with foreign-owned auto manufacturers and that are important to our efforts to operate through the current economic environment without accessing a bridge loan from the U.S. government," said Joe Hinrichs, Ford's group vice president of global manufacturing and labor affairs, in a written statement. Chrysler and GM are required to bring their labor costs in line with those of foreign auto companies' plants in the U.S. Under terms of their loan agreements, progress must be made by March 31. The companies are seeking an additional $21.6 billion in government aid. Chrysler, however, may not be able to match Ford's guarantee of issuing additional shares for the trust if Ford's share price drops, according to a person briefed on Chrysler's negotiations. The person asked not to be identified because the talks are private.